This is an authentic piece of Colonial American Currency. It is issued for the sum of sixty dollars. The front of the bill has the wonderful wording of "THE UNITED STATES” across the top. Also on the front of the note is the issuance date of September 26th 1778. This is one of the first notes that was made and issued under the fledgling United States Government. 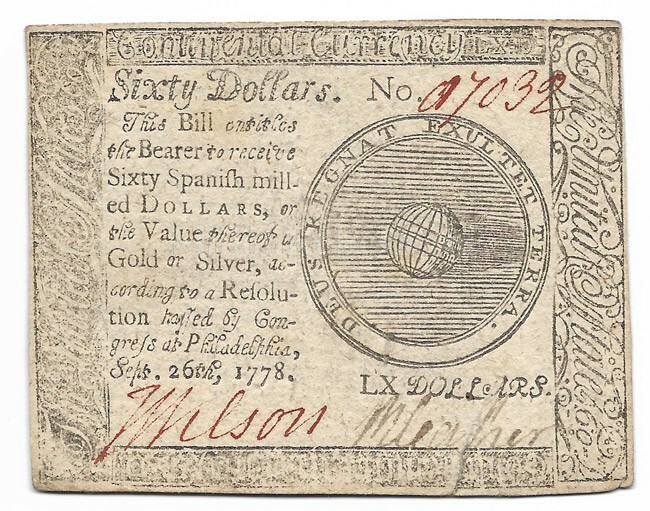 The early colonial currency is a wonderful thing to collect. Each note was hand designed with meaning to each image. This one has the image on the front of the note that the Earth with the motto: "DEUS REGNAT EXULTET TERRA" which translates to "God Reigns, Let the Earth Rejoice". This motto is from the Bible, Psalm 97. This image was designed by Francis Hopkinson. On the front of the note it has the correct hand signed ink signatures and the hand numbered serial numbers. On the back of the note it has the design of the bow in the center. Below that are the printer’s mark and the date of 1778. 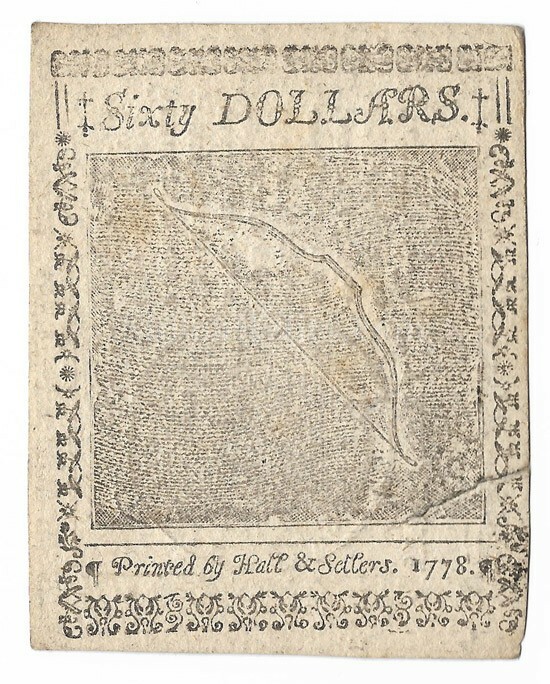 The note was printed by Hall & Sellers of Philadelphia. Before this partnership Hall printed currency with Benjamin Franklin. The note measures approximately 3 inches by 3.75 inches in overall size and is in attractive displaying circulated condition. It comes in an acid free holder for display and preservation. This is a nice authentic early United States piece of paper money.